This week during my trip to Las Vegas, I cuddled my recently found friend Kevin Hines & fought back tears - tears because, if my suicide attempt had of been a different outcome, I would not have been around to experience such an amazing journey. Greg Van Borsum (GVB) an amazing human being, like the Dad of the group - a man who if I wrote down every single accolade I would be here all night. Greg has an inspiring story for every single topic of conversation; from winning Mr Australia body builder, to co directing the film Happy Feet to being part of the ensemble of the 7 Academy Award winning film Mad Max; Fury Road. Certainly an incredible man with loads of life experience. The experience that bought us together was his story of losing friends to suicide. Losing close friends, to being in the grip himself, GVB found inspiration within himself to speak up and inspire others within the construction industry. I could talk for hours on this man, a true gentleman and one who is definitely on this earth to keep people alive. Having the slogan 'it ain't weak to speak' LIVIN aims to breakdown the stigma of mental illness through fashion, social media & events. The boys travel the country co ordinating events and delivering workshops around eliminating stigma. LIVIN came about after Casey lost his best friend since the 1st day of school to suicide. Sam was with their friend on the night of his death and was in constant contact with him but still nobody saw what was to be the loss of life for a beautiful friend. Patty Lawson - this one is a special one for me and one that is close to my heart. Pat and I have known each other for many years, having grown up in the town of Wagga Wagga together. Depression & an attempt on his life - Patty turned to myself for a bit of guidance. After meeting for coffee, we spoke about the troubles he had coming to terms with things. Since that day I have seen this man, from his own doing, grow from strength to strength in helping others and inspiring many he comes into contact with. Helping thousands of people with shares of his video blogs and honest character - a great family man who's doing his best to inspire many across the country and also the rural farming community. Lauren Breen (Loz) - The organiser of our crew & only female on this trip, Loz is bereaved by suicide with the loss of her 19 yr old brother in 2008. Following this heartbreaking time in her life, Loz set out on a journey to help educate people on the effects of Mental Illness & the effects suicide has on a family through the loss of a loved one. Lauren lives in Perth on the west coast of Australia, works a full time job as team leader of a Mental Health program in Perth. Seeing the ripple effect suicide has on a family from a professional perspective, but also from direct family experience. Lauren is part of Suicide Prevention Australia's (SPA) lived experience leadership group & also charity ambassador for SPA, Loz is doing great things in the mental health space across the country and although living in Western Australia, helps me personally by helping coordinate my calendar and streaming emails and locking in events - has saved me many a headache through locking away events and organising my forgetful unorganised ways. 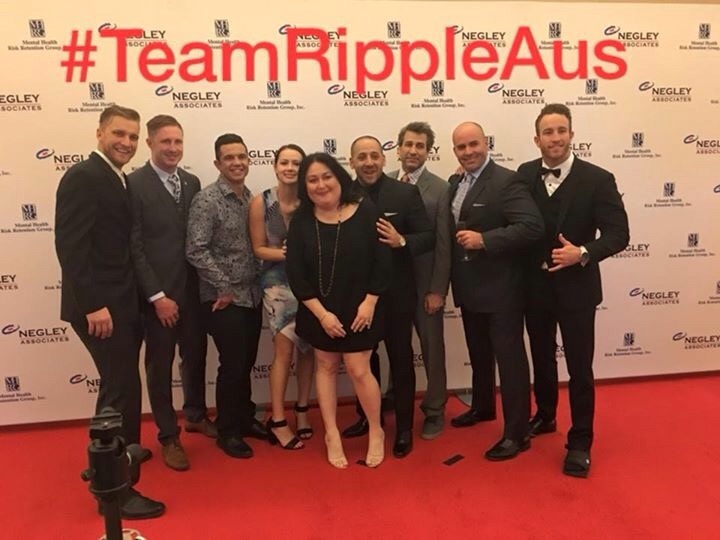 So a huge personal thank you to the self proclaimed boss of the #TeamRippleAust #NatCon16 Las Vegas contingent. Writing this blog on the flight home to Australia, I look back on a week of laughs, learning, boisterous banter, & at times tears - is has definitely been one I will never forget, definitely a moment in time!! !